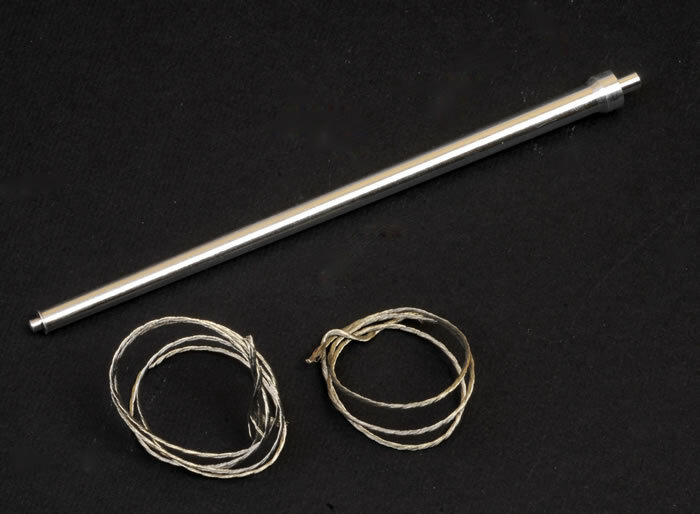 Media and Contents: 1,040 parts in dark yellow coloured plastic; 14 parts in clear; 45 photo-etched parts on three frets; two lengths of twisted metal cable; markings for four vehicles. Advantages: Innovative approach; lovely rolled armour plate and cast texture; many options and spare parts; high level of detail; simpler track attachments; separate aftermarket items including workable track links with operating metal torsion bars and Zimmerit decals. Meng's 1:35 scale Panther Ausf. D is a high quality package. 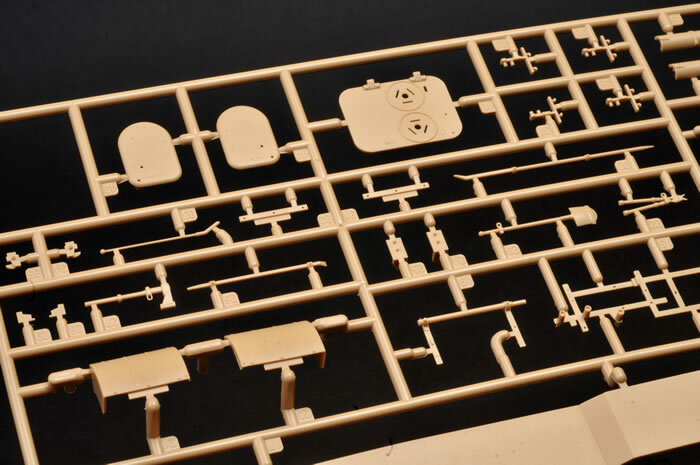 The level of detail is impressive, Meng has supplied many useful options and spare parts yet basic construction of the hull and the turret does not look too daunting. 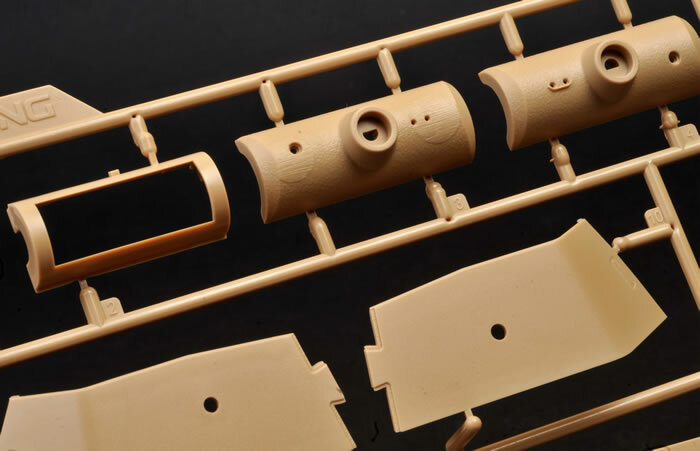 The much simpler sprue attachments for the individual track links (two attachment points in this kit compared to six in the previous Ausf. A release) will also save the modeller a great deal of cleanup time. If you crave fully workable suspension, you are in luck. 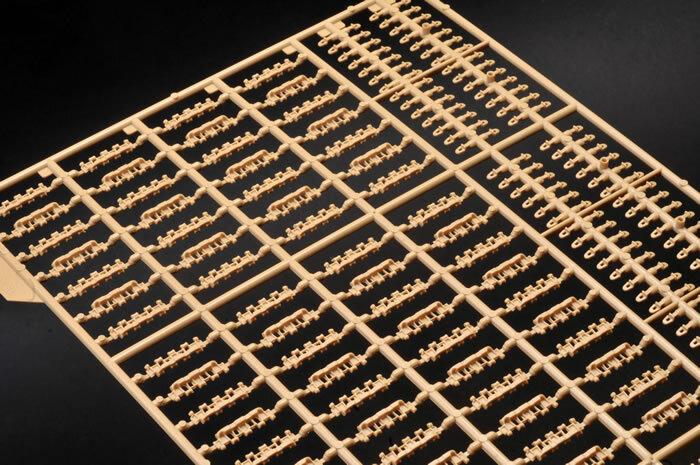 Meng has also produced a fully workable suspension set (available separately) including flexible metal torsion bars and individual link tracks held in place using metal pins. 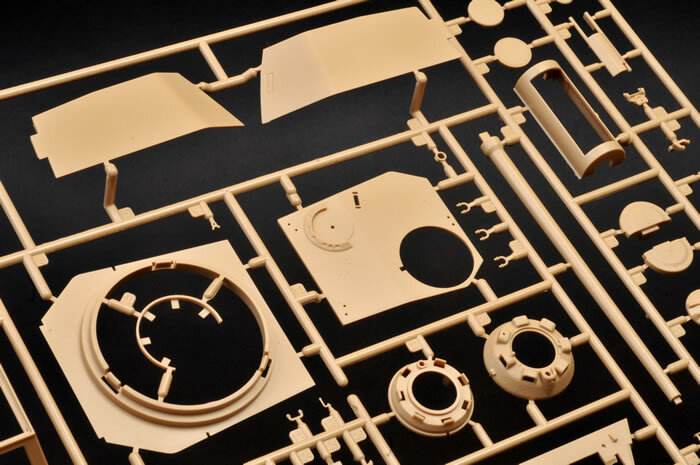 This is a truly gorgeous kit – highly detailed and plenty of useable options. Your spares box will thank you too! The Panther was a German medium tank deployed during World War II on the Eastern and Western Fronts in Europe from mid-1943 to its end in 1945. It had the ordnance inventory designation of Sd.Kfz. 171. The Panther was intended to counter the Soviet T-34 and to replace the Panzer III and Panzer IV. Nevertheless, it served alongside the Panzer IV and the heavier Tiger I until the end of the war. It is considered one of the best tanks of World War II for its excellent firepower and protection, although its reliability was less impressive. The Panther was a compromise. While having essentially the same engine as the Tiger I, it had more efficient frontal hull armour, better gun penetration, was lighter and faster, and could traverse rough terrain better than the Tiger I. The trade-off was weaker side armour, which made it vulnerable to flanking fire. The Ausf. D was the first to be rushed into service in 1943 at the Battle of Kursk. The Ausf. 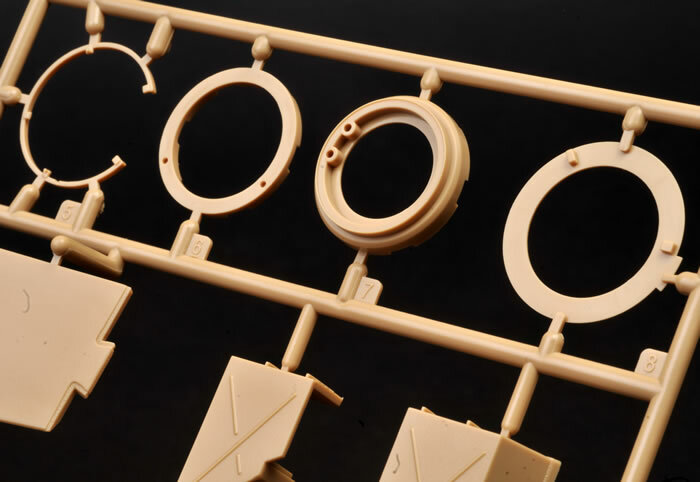 D was the last of the major Panther variants to be kitted as a 1:35 scale mainstream injection moulded kit. The first to market was Italeri with their 1995 release. This in turn was based on parts from their 1976 vintage Ausf. A.
Dragon launched their Panter Ausf. D in 2002. This was considered a landmark kit in its day but it is beginning to show its age now. 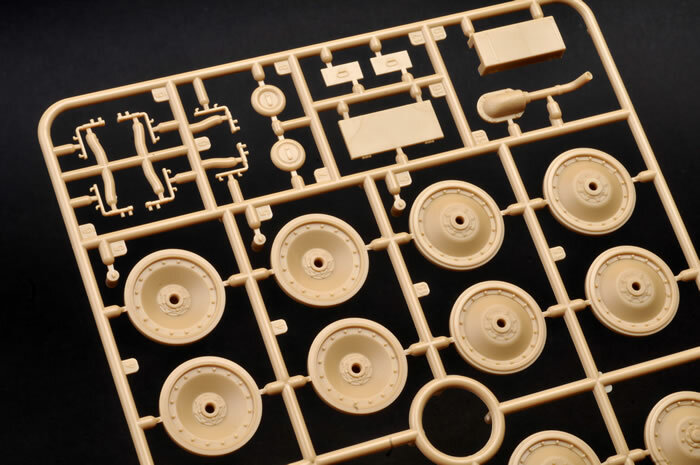 Dragon has released a number of variations on the Ausf. D theme since. 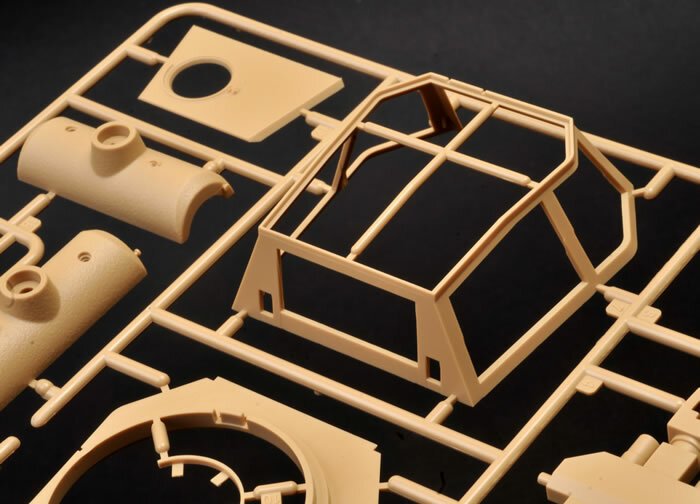 2015 was a big year for Panthers with both ICM and Tamiya releasing new tool 1:35 scale kits. 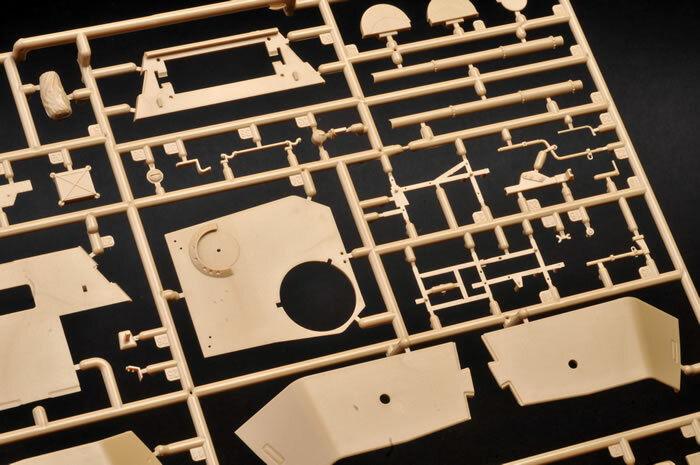 I built the Tamiya kit upon its release and was impressed with the speed of assembly, accuracy and good general detail – in other words, typical new Tamiya. 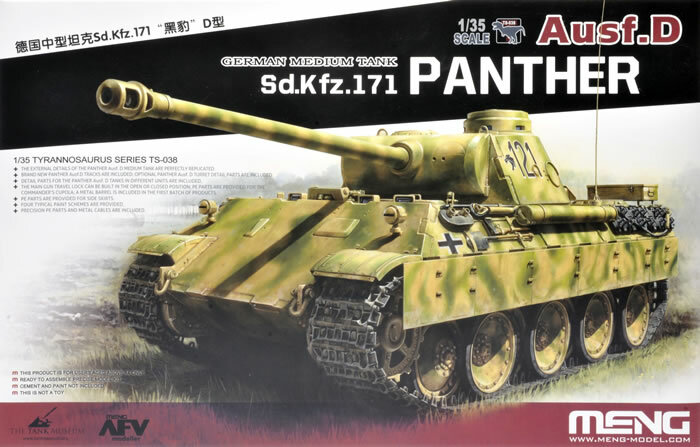 Meng entered the Panther market late last year with their brand new 1:35 scale Ausf. A Late Version. This was a very impressive kit with a large range of options, superb detail and a number of clues that other variants would be coming. 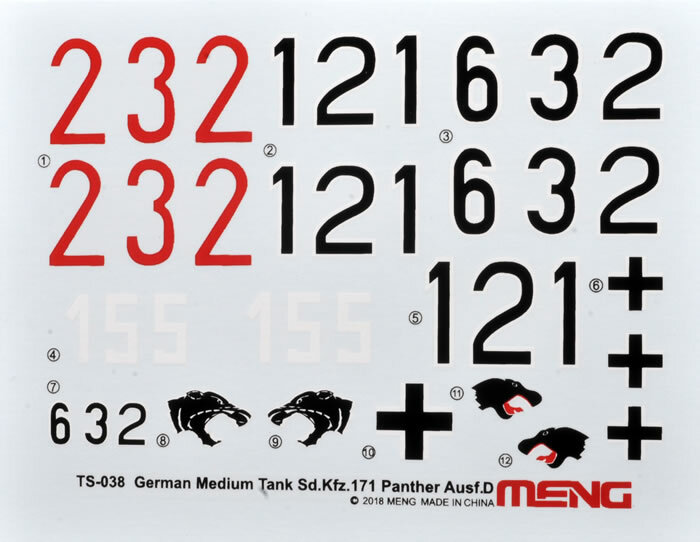 Meng has wasted no time in now offering the Panther Ausf. D.
If you are not a fan of Zimmerit finishes, this is the one for you. It was rare to see a Panther D sporting the distinctive anti-magnetic paste. 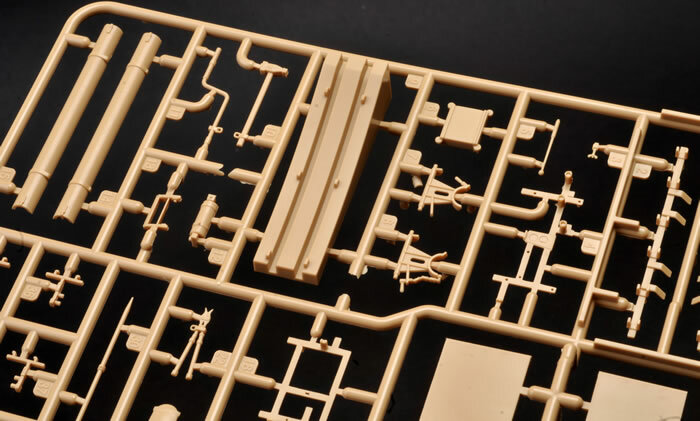 Thanks to the optional and spare parts in the box, you should be able to build most sub-types of the Panther Ausf. D and even an early Panther Ausf. A. 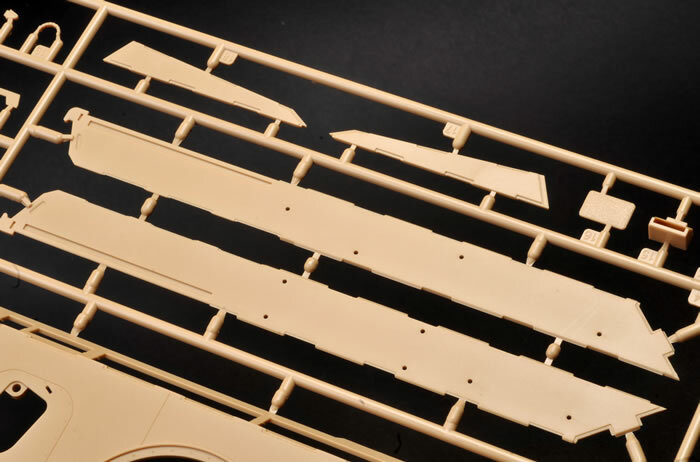 The kit comprises 1,040 parts in dark yellow coloured plastic, 14 parts in clear, 45 photo-etched parts on three frets, two lengths of twisted metal cable and markings for four vehicles. Although the total number of parts may appear daunting, it should be noted that more than 600 of these parts are destined for the tracks with another 92 optional ice cleats. 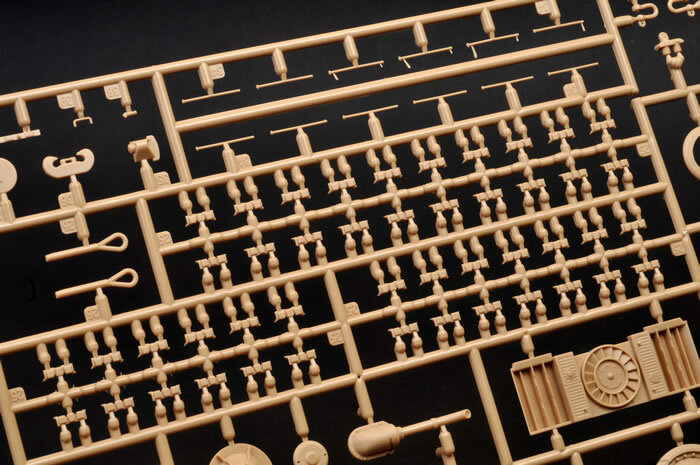 You can also subtract a large number of optional parts that apply to the Ausf. A, bringing the actual number of plastic parts used for the kit (minus the tracks) down to something close to Tamiya's recent Ausf. D and fewer than Dragon's kits. Of course, the two photo-etched frets will lend more detail to Meng's plastic parts. 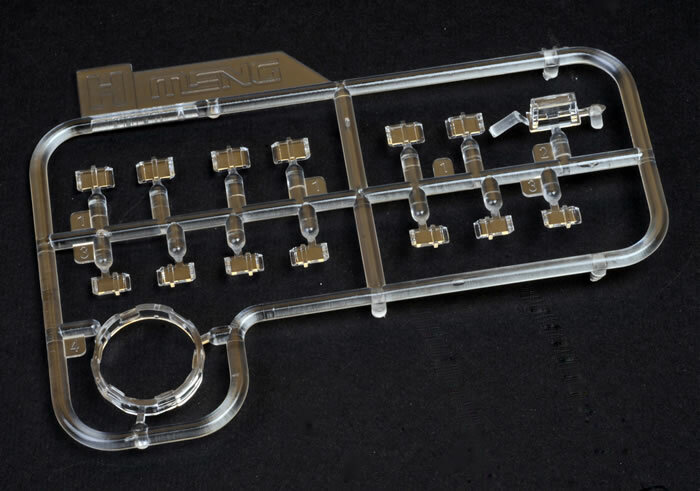 Engineering of Meng’s Panther family is interesting, if not downright unique. The hull is peppered with openings, and the skeletal framework of the turret permits different variants to be delivered via a common framework. Assembly starts with the running gear and lower hull. The road wheels, idler wheels and drive sprockets are attached via polythene caps, which should make painting the layered suspension arrangement a bit easier. Full sets of Panther Ausf. D (16 bolt) and Ausf. A/G (24 bolt) road wheels are supplied. Alternative drive sprockets and three different styles of cupola are also included. The lower hull is made up from a flat pack of sides, rear and bottom. This is made rigid by two braces fitted to the inside. 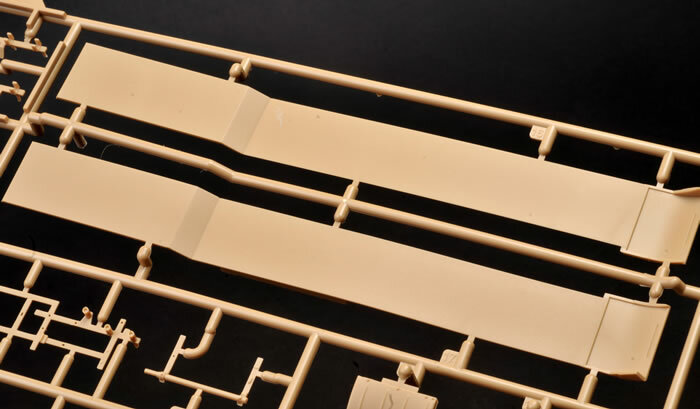 Suspension swing arms are separate and designed to be glued in place. The individual track links are made up from three parts each - one remarkably cleanly moulded main link (no ejector pin marks visible at all) and two individual hollow guide horns. Optional ice cleats are also included. In the previous Ausf. 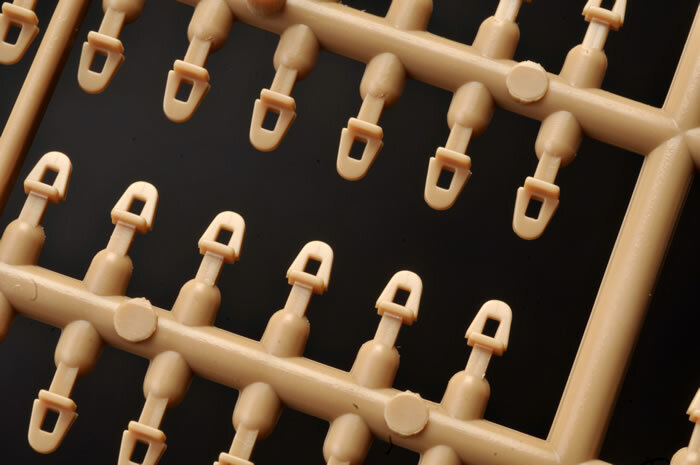 A release, each main link was connected to the sprue via six attachment points, which would have proved a bit tedious for removal and clean-up. 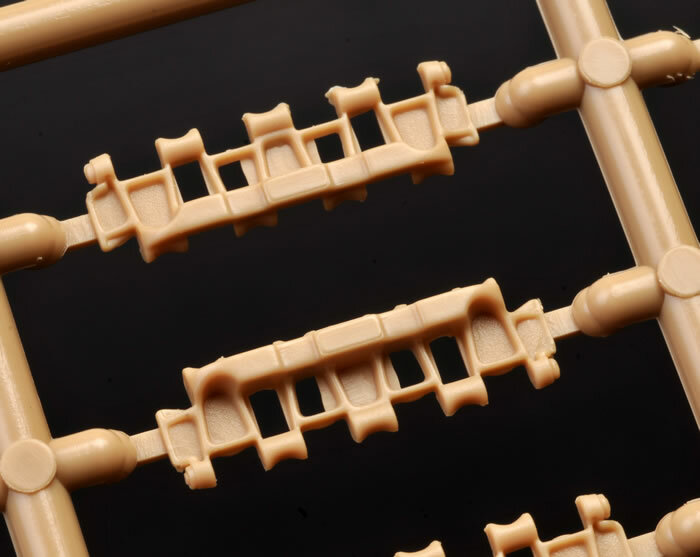 This time around, the main section of the track link is held in place by only two sprue attachments, with the guide horns attached to one each, making the task much faster. The links are designed to be assembled on the included jig, moulded in a ski-jump shape. The links are a nice firm press fit and are designed to be glued together. Alternative exhausts are included, as well as unique Panther Ausf. D features such as the snorkel, raised stowage boxes and ladders for the rear deck. The rolled armour plate texture on the separate hull front and sides is very authentic. These panels are glued over the top of the main hull part. Cast texture elsewhere is equally good. The driver's visor and the upper hatches may be posed open or closed. Another interesting option is a plug on a chain for the front machine gun position. The gun crutch may be posed raised or lowered. Full front fenders plus feeler poles are provided as options too, as are two styles of gun cleaning rod tube.. Fan and engine detail is supplied on two individual parts that are glued in place underneath the engine deck grilles. 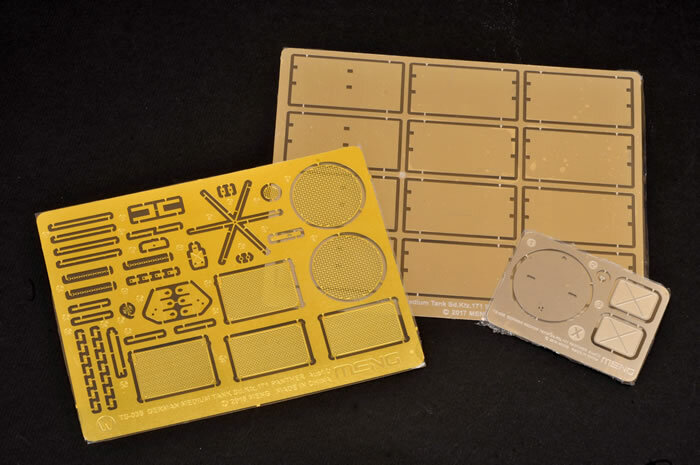 Photo-etched covers are included for the engine deck grilles. Side skirts are included as an option, and track hangers may be mounted on the sponson covers. Individual bolt heads are offered for the top of the track hanger rack. Spare tracks and pins are included too. One of the photo-etched frets has the star aerial of the Befehlspanther command vehicle. The individual turret panels are designed to be glued to the skeletal framework. Alternative left side panels are offered for early (with shell ejector hatch) and late (without the hatch) versions. 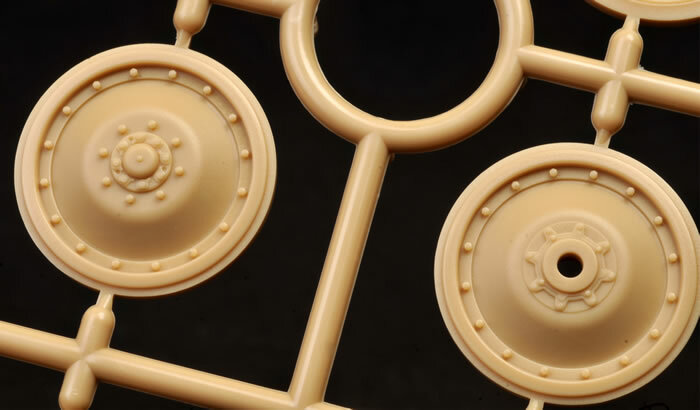 Two styles of the shell ejector hatch are supplied too – one with the “eyebrow” gutter fairing and one without. 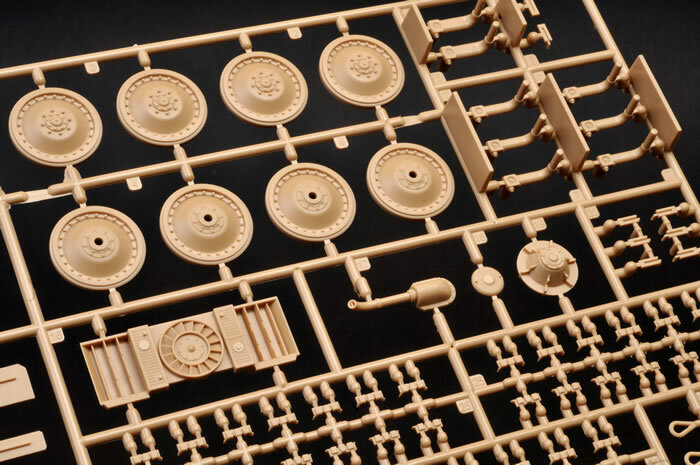 There is also the choice between two alternative cupola machine gun mounts. 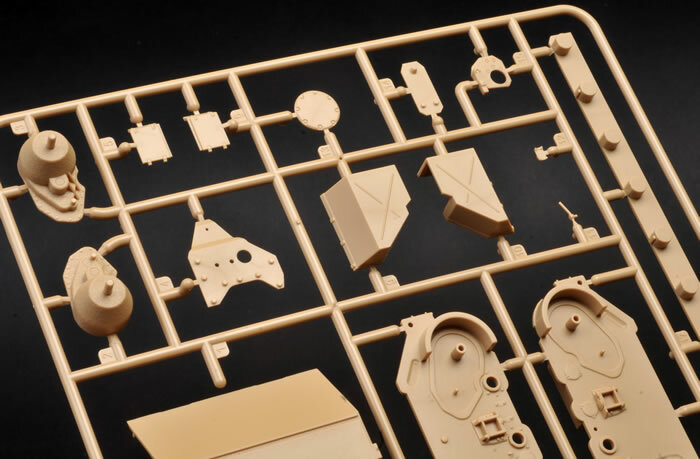 All the parts for a Panther A turret are included as spare parts on the sprues as well. The gun is moulded with basic breech detail - sufficient to satisfy if glimpsed through the open turret hatch. The gun barrel is turned metal with a three-piece plastic muzzle brake. Clear parts are included for the vision blocks. Two styles of MG 34 machine gun are offered, plus an ammo belt and a detailed mount with spent shell bag. Markings are supplied for four vehicles.